By a voice vote the Senate Armed Services Committee last week approved an amendment offered by Sen. Claire McCaskill (D-MO) to improve whistle blower protection for Department of Defense contractors. The Government AccountabilityProject reported that the action came as an amendment to the half-trillion dollar National Defense Authorization Act for the Fiscal Year (FY) 2008 (S. 567). 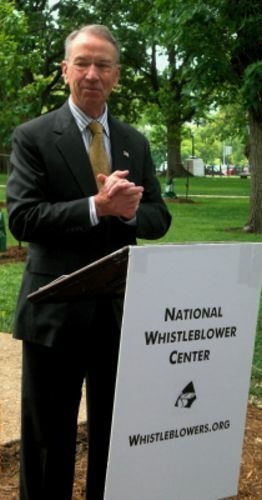 In March the House of Representatives passed the whistleblower rights bill H.R. 985 by a331-94 margin. (Prior blog post on that.) Whistleblower advocates hope the McCaskill amendment signals that support is strong in the Senate as well. One last whistleblower note: Deepwater is the name of a Coast Guard scandal. Here is a link to a recent 60 Minutes report on how a $24 billion ship refitting program went awry. In is interesting to me that Lockheed linked to the unflattering POGO press release and headlined it: “Deepwater Whistleblower Challenges Testimony by Lockheed Martin.” That’s pretty open PR on a sensitive subject. This entry was posted in whistleblowers on June 4, 2007 by Tom Abate.